Content is copyright of company represented, but page format is my copyright - do not distributed. Planar Monolithic Industries (PMI) recently introduced three new products in their extensive line of RF and microwave components. One is a 35 dB low noise amplifier (LNA) covering 0.5 to 2.5 GHz, another is a 32 dB 10-bit programmable attenuator for frequency range of 14.0 to 40.0 GHz, and another is a 2-18 GHz 8-Bit, vector phase shifter (VPS). Contact PMI today for more information. The LNA-35-500M2D5G-0D6-25-12-SFF is a Low Noise Amplifier operating over the 0.5 to 2.5 GHz, Low Noise Amplifier. This model offers a typical gain of 35 dB while maintaining a typical gain flatness of ±1.6 dB and a maximum noise figure of 0.6 dB. This compact model is outfitted with SMA female connectors in housing measuring 1.25" x 1.25" x 0.563". 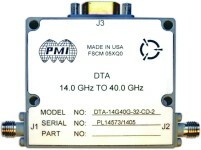 The DTA-14G40G-32-CD-2 is a 10 Bit programmable attenuator with step resolution as low as 0.04 dB which provides over 32 dB of attenuation over the frequency range of 14.0 to 40.0 GHz. This model is offered in a slim line housing measuring 2.0" x 1.8" x 0.5" with 2.92mm female connectors and operates on a single +15 VDC supply with only 40 mA of current consumption typically. Specifications include Insertion Loss 9.0 dB Typical, VSWR 2.0:1, Attenuation Flatness ±1.5 dB Typical, Attenuation Accuracy ±2.0 dB Typical, Power handling of +24 dBm CW maximum, and Input 1dB Compression: +10 dBm Typical. The PS-2G18G-360-8D is a 2-18 GHz, 8-Bit, Vector Phase Shifter making it ideal for frequency translation where continuous monotonic phase shifting is required. This model features high speed switching (<410 ns measured), phase shift 360° with a ±15° accuracy (typical), 18.0 dB maximum insertion loss and typically lower than 60 dB harmonic distortion. Package Size: 4.25" x 3.50" x 1.00", SMA(F) connectors,DC-37P, Sub Miniature D Multi-Pin control connector and operates using ±12V to ±15V @ ±100 mA maximum. Planar Monolithics was founded basically to take advantage of the growing demand in monolithic-based products using the hybrid MIC/MMIC technology innovations that are mushrooming in a big way all over the world. High performance and reliable products can be obtained by using this technology. Planar Monolithics will meet these requirements. Planar Monolithics organization has been setup to design, develop, manufacture, test, and market complex state-of-the-art hybrid RF/microwave and monolithic integrated circuits (MIC/MMIC) and components, and hybrid MIC/MMIC supercomponents and subsystems. 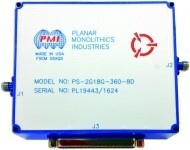 Planar Monolithics provides its unique products for applications in space, military, communications, telecommunications, commercial, and consumer electronics systems.